Content Marketing is a relatively new term (first used in 1996), which describes a very old technique used to spread and establish the reputation and presence of a company. In simple words, Content Marketing is the technique through which your company offers free information (articles, images, video) about the products or services you provide and communicates it using all modern communication media (websites, blogs , forums, etc.). This practice began in 1891 when August Oetker, decided to sell baking powder in packages on wich recipes were printed. Later he made a book "Cooking Guide" which he provided for free to his customers. In 1895, the same idea was used by John Deere, who established a periodic version information for farmers. And the most known example of the use of Content Markenting is Michelin company, which in 1900, decided to issue a guide for motorists with information about the car (maintenance, repairs) and travel information (accommodation, restaurants, shopping). "The first version of the guide distributed free Michelin 35,000 motorists." All the above examples show that all these companies, and many more managed to establish their name and reputation, giving the audience what they were looking for. They manage to create confidence in the company, in which the audience was addressed for shopping. Today, Content Marketing is based of the same principles. The difference today, is the change of means used to spread the information. Back then, it was a printed information (in packaging, or in a magazine or in a book), and today the world of internet (websites, blogs, forums, newsletters, etc) is used. Trying to better understand Content Marketing, you should know that a successful Content Marketing strategy answers the question to your audience, "How can I help you?". You may be suprised since your website primarily aims to answer this very question. However, through your website you address to a wide audience, with different interests and needs, so your information is quite general, in odrer to help and inform the majority of users. Through blogs, forums, and other tools, you can offer different useful information depending on the target audience. For example, if you are a travel agency, you will provide different information to a family who is planning its summer vacation while other information will take a group of students and of course other information you will give to the organizers of a conference in your country. So, depending on your target audience, you modify the content of the information you provide. Offering useful information, all in connection with the subject of your own business, to a wide audience, cultivate confidence and establish loyalty to your products and services. Your company name becomes the first name that comes your users' mind when they are looking for the products or services you offer. 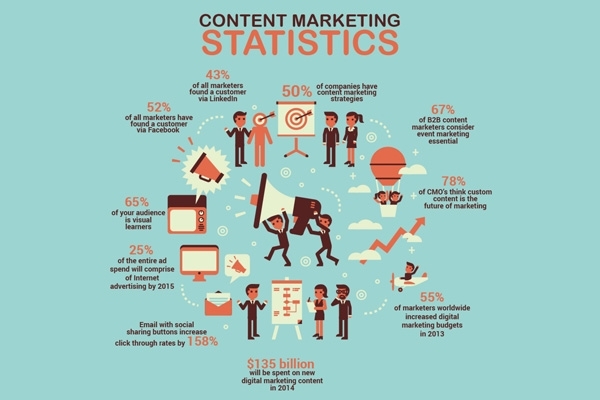 Content Marketing is a major factor of your business success. You need an effective content marketing strategy, which should be designed by professionals who, using with their knowledge and experience will ensure you the best possible result.